""In women, it has been demonstrated that major weight increases often occur during menopause, the time in a woman's life in which cyclic ovarian function ends and the ovarian hormones estrogen and progesterone decline. The goal of this research was to determine whether, and to what extent, the decline in these hormones have an effect on body weight in an effort to better understand and proactively treat obesity." Dr. Nanette Santoro of the Albert Einstein College of Medicine reassures us that this weight gain is more about aging and lifestyle than female hormone troubles. As we age, body fat increases, lean body mass decreases, and we all get more sedentary. She notes, "The relationship between the use of hormone therapy and weight gain appears to be temporal, not causal." Indeed, the PEPI trial, a three year study comparing hundreds of women on various hormone therapies vs. no hormones at all, found that supplemental hormone therapy did not cause weight gain. Better yet, Dr. Haarbo and colleagues at the University of Copenhagen found that combined hormone therapy prevented an increase in abdominal fat after menopause, a dangerous pattern of weight gain associated with increased risk of diabetes and heart disease. The hormones promoted a more "gynecoid" body type (as in hour glass) versus the "android" silhouette, (as in no waistline). Thanks for popping in Judy! Hope to see you quite often on this new board and especially in the new chat room.... I'll be calling you soon about that! This is interesting reading this. I haven't said anything to a doctor or inquired about HRT, although I wonder about it with all the pros & cons. It is frustrating for me that all my life I have been a bit paranoid about my weight. 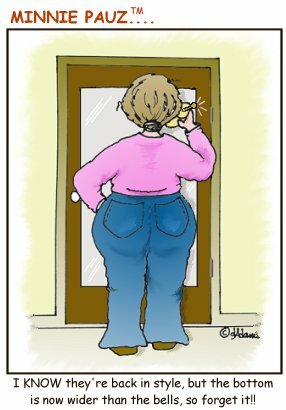 It doesn't bother me one bit what my friends or people I see weigh or look like, but I tend to be paranoid about my own, so all of a sudden this year for all the symptoms to hit - including weight gain is frustrating and humbling specially when I try to wear jeans that I shouldn't have a problem with. Maybe it is just recompense for being a stickler about my weight all these years. Rositaema wrote: This is interesting reading this. I understand what you're saying! I really think the key is to "get real" with ourselves at this point. (another Dr. Philism I like) Being realistic and educated about this time of life is very important. Otherwise we stay in denial and end up heavier than we ever imagined....that's what happened to me. Realizing it's normal at this stage of life and accepting the fact that we're not going to be who we were in our 20's is a big step too. There's so much psychological mixed with the physical elements that we have to deal with. You made a good point when you said it's "humbling"....maybe that's what we need as part of our wake-up call.